Does Scenesmager not remove the previous sprite? I downloaded a very cool scene management code package that you have here on the site. But during the tests with the games here I realized that even when you change the scene, the previous scene (and what you have in ENTER_FRAME of it) continues to run. Does the scene manager remove only visually? Is there a right way or command to permanently remove the previous Sprite / Scene? Or did I get it wrong and this Scene Manager always leaves all scenes on? I don't know how removeChild works "under the hood" (does it removes attached events? does it removes child? 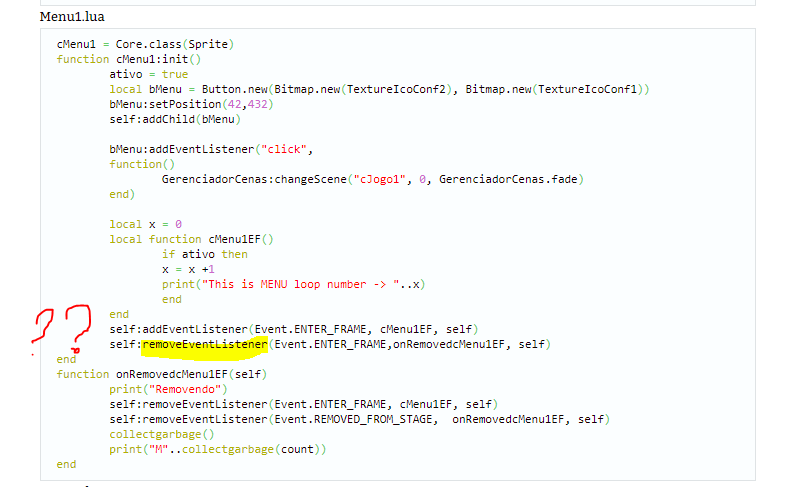 ), but usualy i'm using transitionEnd event, where i'm clearing stage "by hands" (just removing events). And it seems like it enough (i asume that garbage collector removes childs, cuz they are not used). The scenemanager has events to let you know when the scene has ended - use these to remove extra events you added at the correct time - eg when the scene starts to end of when it has actually ended. @oleg, the scene can still be animated while it transition out, maybe that's what @SinisterSoft actually needs ? But it really depends on the game. I was just showing that there are some built-in events that can be used to turn things on/off at the correct time. Well that's my doubt. Coincidentally, all the demos and studies I did using the Scene Manager used a time loop instead of the Enter_Frame. So before I pressed the fade buttons to change the scenes, I stopped the execution of the loop. So until this current project I had not noticed that the loop event still worked even by unloading Object rs. @oleg and @SinisterSoft Thank you for your help. I got it and I'm doing tests here. I did a test using my friends' tips and it kind of is weird. He continues to run the event for a while before stopping. There are two scenes, one called Menu1 and the other called Game1. Each has a button with the function of loading the other scene and an ENTER_FRAME containing a print that identifies the scene and counts. Edit: Does it continue to run the event because while it is giving the transition effect the scene is still active? Edit 2: I failed miserably. Enterframe events continue to run even by placing the suggested codes. Too bad I do not have the competence to use something that is already ready and works for everyone. I must have been very affected by sleep. I swear that at the time I wrote it made perfect sense, but not now. Thanks for the help, I used the code the way you showed me and now the events are being eliminated correctly along with the sprites. Sorry for the delay in giving feedback but I had to work with other things and I only got back on the pc today.